Although squirrels come to your garden to look for materials such as moss for nest lining, or to drink from you garden pond, the biggest attraction is food. Should I Feed Red Squirrels? Urban areas have less natural habitat and natural food available for red squirrels. Therefore, supplementary feeding is essential; as well as providing valuable nutrients, it will prevent starvation and encourage more regular breeding – red squirrels will mate more than once a year if food is plentiful, however, they may not breed at all if food is scarce. 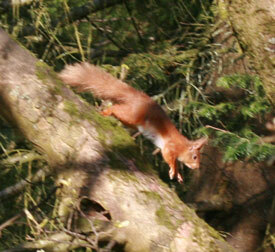 Feeding red squirrels can also provide hours of wonderful entertainment as you watch their amusing antics! What Precautions Should I Take When Feeding? The feeder and the food must be kept as clean as possible to prevent the spread of disease, PARTICULARLY THE SQUIRREL POX VIRUS. Feeders should be regularly cleaned (preferably every week) with a disinfectant/water (1:10) solution or a detergent such as Citrox, Virkon or Ark-klens – these are safe for animals and they destroy bacteria and prevent cross-contamination. They are available from most animal feed stores and some garden centres. Sweet, dried foods such as raisins and sultanas must be avoided, as these are hard to digest and can cause calcium deficiency. The food should be placed as high as possible – a good feeder location is against a tree or wall so that the squirrel doesn’t have to cross open ground. It must not be scattered on the ground as cats account for a high number of fatalities in gardens visited by squirrels. What Food Should I Provide? It is best to feed a variety of different foods, similar to those that the squirrel might forage for in the wild. In fact, the red squirrel will pillage the nuts and seeds found naturally in your garden. 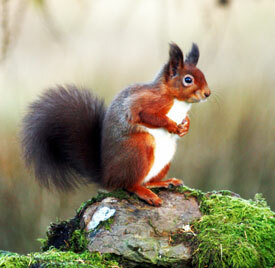 The most suitable foods for red squirrels are hazelnuts, sunflower seeds, beech (cob) nuts and pine nuts. Sweet chestnuts and walnuts are also suitable. Unsalted peanuts are another favourite, but should be not be given in isolation. Some squirrels also like oats. Please note that red squirrels don’t usually like maize (sweet corn). Young red squirrels can suffer from calcium deficiency if they feed too often on the wrong sort of food. Therefore, peanuts should not be given exclusively, but as part of a varied diet. If available, an additional calcium source could be provided with your squirrel food. This is particularly valuable during the summer for juvenile and female squirrels. To reduce calcium deficiency provide: pieces of apple or carrot; a supplement added to the feed or a dish of drinking water; bone meal added to the dry feed mix; a cuttlefish bone or antler placed near the feeder. Also provide a source of water if it is not naturally available. Please note that grey squirrels love maize and mixed squirrel food, therefore, to discourage them, don’t provide these foods. Can I Make a Squirrel Feeder? How Often Should I Feed? Regular feeding every few days is best rather than having food permanently available, as this will encourage the squirrels to forage for natural food too. This way, you are providing a supplementary food source rather than the only source of food and you will not encourage them into bad habits. However, please top up your feeders more regularly during the summer months when natural food is scarce. Feed throughout the year. 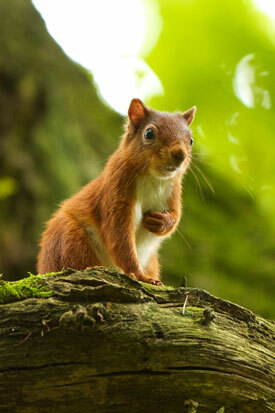 In the wild, red squirrels feed on shoots and flowers in spring, and nuts and fruits in autumn and winter. The critical period to feed reds is during the summer months before the fruits and nuts are ripe, when their natural food is in short supply. Continued feeding throughout the winter will also provide an additional boost to the squirrels in your area. If I feed, will squirrels visit every day? Not necessarily; squirrels may visit a number of locations for food and may not visit your garden every day.